Consumer affairs programme. A look at standards in the permanent make-up industry. Lots of people in the UK are getting permanent make-up done, like tattooed eyebrows or permanent lipliner. If you want to set up a salon to do permanent make-up treatments there are hygiene regulations. To tattoo anyone you need a licence from your local authority. But there's no regulation on training standards and the quality of the work can vary a lot. We'll hear an example of bad practice, and look at how standards could be improved. Figures suggest the number of disabled people using Britain's rail network is growing. Last year, the number of times a disabled passenger was given assistance rose to over a million. 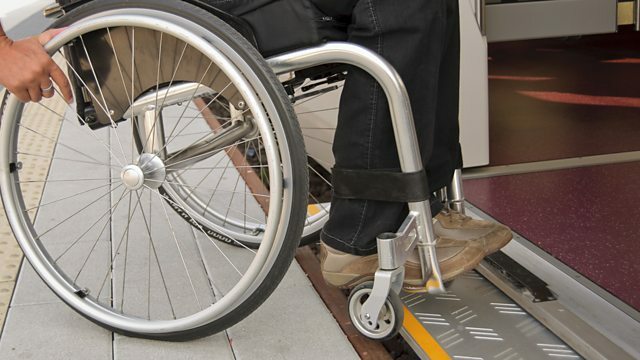 If you're in a wheelchair you need a member of staff to put down a ramp so you can get on the train, but campaigners fear it's a right which could be put under threat across the network. We'll examine how proposals to increase the number of driver only trains could affect things at operators who plan it like Southern Rail. The Department of Transport says it's determined that disabled people should have equal access to public transport. It also says Southern Rail services that are staffed by a conductor meaning trains will continue to have a second person on board who can provide assistance to passengers. And if you're a keen cook - have you seen the new generation of recipe that doesn't come with instructions? Video recipes are enormously popular online, and are usually quick and easy. The videos don't have any written or spoken instructions. Instead, we watch a faceless pair of hands assemble a meal in under 90 seconds. They get millions of views. We've had a go at one of the most popular recipes to see how it works. How successful have promoters been in cracking down on ticket touts? Shares in Majestic lost more than a quarter of their value yesterday- what went wrong? How will plans to remove guards from trains affect disabled travellers? Exploring the popularity of 90-second online cookery videos. A look at the permanent make-up industry and its training standards.